After establishing electric guitar basics in the Primer module, the Worship Dynamics series will expand and develop your range of playing technique. WDI will ground you with mastering the use of effects pedal along with the familiarization of use of the capo. This will set you on a path of greater playing freedom in playing different keys and expression through guitar sound effects. The thematic focus on THE HOUSE OF YAHWEH offers an experience in walking through and surveying the symbolic artifacts within God's tabernacle. ii) Have playing experience with familiarity of open chords in the key of G. You must also be able to change chords smoothly and possess a firm strumming rhythm. We accept registrations from ages 13 and above. We will channel students to classes of compatible age groups whenever possible. Conducted in small groups (i.e. 6-8 persons), the 1 hr per week sessions include: Set-up and usage of Guitar Effects Pedal, Flat Picking Patterns and Chord Embellishments. Do I have to bring my electric guitar around? Is it convenient? All Training Rooms are fully equipped with practice guitars. Our Training Centre is conveniently located at International Plaza - Flagship (beside Tanjong Pagar MRT station). You'll get to meet people who share the same passion. Learning to play a musical instrument is highly rewarding because it leads to growth in a music-spiritual dimension. Learning to play the electric guitar is more than fun. It's life changing. 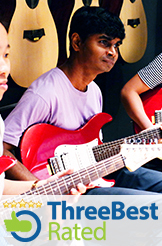 We all know of people around us whom we think have successfully learnt to play the electric guitar reasonably well. With practice, this skill will stay and enrich not only your lives but also the lives of people and family around you (and generations to come). For many of us who are just starting to pick up this unique skill, believe that the journey is well worth it. How is the Electric guitar different from the Classical and Acoustic guitar? Classical and Acoustic guitars are able to produce sound from its own body, while the Electric guitar uses electro-magnetic pickups (transducers) that converts energy produced by the vibrating guitar strings into electrical impulses that is fed to an amplifier. The amplifier then magnifies these pulses many times before the loudspeaker transforms them back into sound waves. Because of the mechanics involved, the electric guitar is able to produce a variety of sounds that the classical and acoustic guitar is limited to. We make it possible for you to track whoever signs up for the course and even include a subsidy appropriation. Are you interested in equipping and mobilizing the cells under your care in regards to worship? Please contact us for an appointment. We'd like to share with you how this electric guitar program can mobilize your cell ministry members and raise the level of worship involvement.